South Korea’s air force would be best served in the near term by a mix of fighters that includes an advanced version of Boeing’s F-15, according to retired U.S. Air Force general and former chief of staff Ronald Fogleman. The F-15 would provide needed combat capability to counter the threat posed by North Korea right away, whereas Lockheed Martin’s F-35 will lack full combat capability until around 2020 when its Block 3F software is installed and tested, he said. Fogleman, a former fighter pilot, served as Air Force chief of staff between 1994 and 1997, when he retired from the service after 34 years of active duty. For two years he was the air component commander of combined forces in South Korea. He now consults for Boeing and serves on the boards of several companies, including Alliant Techsystems (ATK), a supplier of composite parts for the F-35 Joint Strike Fighter. He spoke to reporters on November 4 at a media roundtable organized by Boeing to discuss South Korea’s $7.2 billion F-X III fighter competition. In late September, an executive committee of South Korea’s Defense Acquisition Program Administration (DAPA) unexpectedly rejected Boeing’s F-15 Silent Eagle, the sole remaining contender for the 60-aircraft F-X III requirement, in favor of restarting the procurement process. A Korean government task force is now considering alternatives such as changing the number of fighters to be acquired, increasing the available funding or combining different types of aircraft. Following DAPA’s decision, Boeing, Lockheed Martin with the F-35 and Europe’s EADS with the Eurofighter Typhoon indicated they would respond with bids for a new competition. The three companies showcased their respective jets at the recent Seoul International Aerospace and Defense Exhibition. 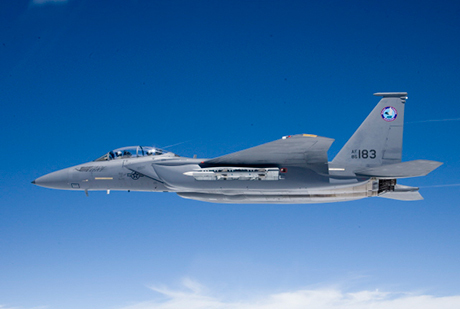 Fogleman said South Korea’s decision to set aside the F-15SE with conformal fuel tanks and weapons bay, reportedly because it lacks stealth, surprised him. The F-35 is without question the stealthier aircraft, but it currently lacks the lethality of the F-15, he argued. The Republic of Korea Air Force (ROKAF) is integrating weapons on its existing F-15Ks, such as the Taurus KEPD 350 air-launched cruise missile, that would be applicable to an advanced F-15. Meanwhile, the U.S. Navy has deferred initial operational capability of its F-35Cs until 2019, when they receive full-capability Block 3F software, he said.